In this post, you’ll learn about the science and “why” behind this month’s Intensification Block. You’ll learn about our program design, rep schemes and the effects of this training on the muscular and nervous system. As a quick reminder, Allegiate training blocks are 4 weeks each. We rotate between two, central themes: Accumulation and Intensification. Accumulation Blocks focus on high volume-based training. For 4 weeks, we focus on work capacity, muscular endurance, body composition, and conditioning. Intensification Blocks focus on lower reps, higher weights. For 4 weeks, we’re working on our speed, power, and strength. The format of this block is different. But first, let’s start with talking about Progressive Overload. Progressive Overload means steadily increasing weight to the movements, week-after-week. This is the recurring theme of all Allegiate training blocks: try to improve compared to the previous week. It might be 10 kg or 1 kg, but we’re always trying to add more weight. So by week 4, we’re giving our absolute max effort because we’ve ramped into that weight in the preceding weeks. When it comes to progressive overload, this style of increasing intensity is the Allegiate default. For this Intensification block though, we’re switching up the format of our progressive overload. We’re breaking the mold. Instead of adding more weight, we’re adding reps. Why? Remember the definition of insanity. If you do the same bench routine on Mondays for the rest of your life and expect a different result – you’re stupid. Let’s dive deeper into the science behind that wisdom and how it relates to our bodies and nervous system. Adaptation of the muscular system is a fairly linear process. When we apply stress, the body responds by applying more tissue around the stressed area. Stress (like lifting weights) = Response (building muscle). When it comes to the nervous system, however, the change is not as linear as it is with the muscular system. Here’s Coach with an example of the impact of your environment. Let’s say we put 50% of your 1 Rep Max on the bar and you squat it. That alone might not create much of a visceral response. However, if we asked you to squat 50% while playing Gesaffelstein, adding strobe lights, and threw wild caught venison blood all over you while squatting – you might have a different experience. 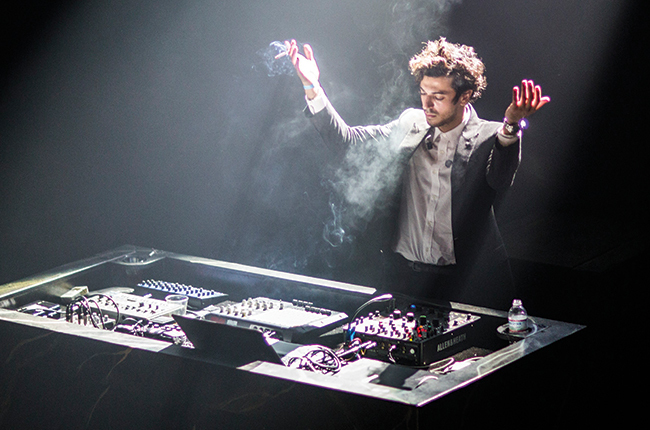 Gesaffelstein is one of Allegiate’s most played pandora station. Allegiate studies have shown that heart rates and intensity skyrocket when his music is played. Here’s a simple way to look at all this. Week 1 – Hit 3 reps @ 85% of your max. Week 2 – Hit 4 reps. Week 3 – Hit 5 reps. Week 4 – Hit 6 reps. This block is designed like #2 above. And behind that program “design trick” is a lot of science. Our Autonomic Nervous System (ANS) governs all actions in the body. The ANS breaks off into the Sympathetic Nervous System (SNS) and the Parasympathetic Nervous System (PNS). The SNS is fight or flight and the PNS is rest and digest. The Yin is the PNS and Yang is the SNS. The world we currently live in is a very SNS world – it’s always fight or flight. We are constantly under stress and more prone to larger reactions to everyday stimuli. In a constantly stressed situation, we transition directly to adrenaline and noradrenaline. Which means our nervous system is running on fumes. This is amplified if we are fighting to recover from training, under duress from our training, and are placing a lot of pressure on a certain aspect of training. Like setting a new PR, for example. This block, we broke the mold. We changed how we progressively overload to limit burden on our SNS. Rep scheme wise, we put a challenging load with a smaller rep range to start. Like 2-3 reps. That smaller rep range will reduce our stress response and possibly override any limitations we might get from the environment when we train. By starting with a lower rep range and then simply adding a rep each week we lower our anxiety towards a weight and rep scheme and just simply train. We’re also using some technology to help us with this block. To give clear recommendations on the load we should use, we’re using a piece of technology called a Tendo Unit. A Tendo Unit gives clear recommendations on the load we should use. It’ll let us combine subjective (how we perceive the environment) and objective (what our nervous system actually allows us to do). With a target of .8-1.0m/s on each rep, we can objectively see the correct load to use and set that as a baseline to train. Your reps might feel really light. Or they might feel really heavy. But with the meters/ second reading on the tendo unit, we can give clear indicators of progress. As long as technique & positions are good, of course. Lastly, the B and C series will be a ton of isometrics. Those Iso’s will help in end range control – how well you can maintain your positions in the bottom of a squat, for example – and challenge our nervous system. Never miss an Allegiate Blog Post. Enter your information below to join our newsletter. Trust me, it’ll be the best decision you make this week.